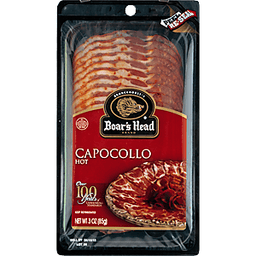 Boar's Head Hot Capocollo. Peel. Re-seal. Brunckhorst's. 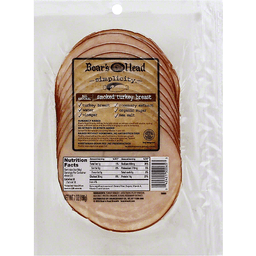 Boar's head brand. U.S. inspected and passed by department of agriculture. Capocollo hot. Over 100 years of unwavering standards. Visit us online at www.boarshead.com. 0g trans fat per serving. Gluten free. Good source of protein. Milk free. No MSG. 2009 Boars Head Provisions Co., Inc.
Brunckhorst's. 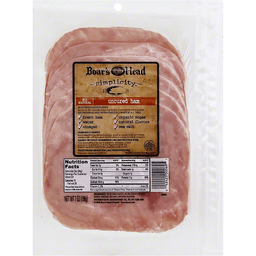 Boar's Head® brand. U.S. inspected and passed by department of agriculture Est. 9992. 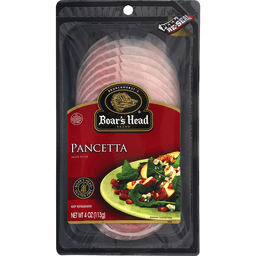 Pancetta. Ready to eat. Boar's Head. Gluten free. boarshead.com. 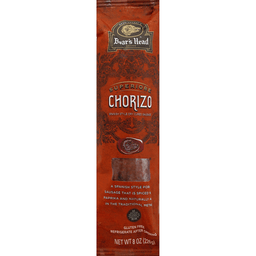 ©2013 Boar's Head Brand®. 0g trans fat per serving. Gluten free. Milk free. No MSG added. The great organic uncured turkey hot dog. Not preserved. No nitrates or nitrites added except for those naturally occurring in sea salt & cultured celery juice powder. 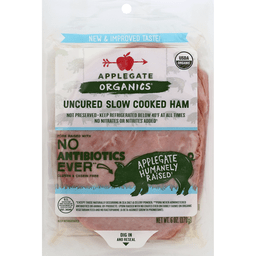 No antibiotics used (turkey never administered antibiotics or animal by-products. Vegetarian grain-fed diet). 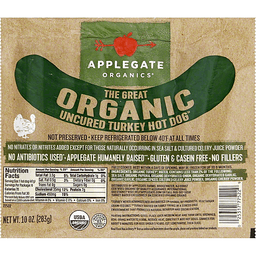 Applegate humanely raised (Turkey raised on family farms in a stress-free environment that promotes natural behavior and socialization). Gluten & casein free. No fillers. Certified organic by Quality Assurance International. Questions? Visit help.applegate.com or call 866-587-5858. Turkey raised exclusively on certified organic grains. USDA organic. Inspected for wholesomeness by US Department of Agriculture. Real food has a story. Visit us online and learn more about the people, places and practices behind our products. 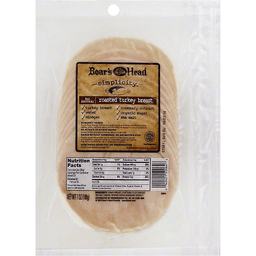 Boar's Head Simplicity® Roasted Turkey Breast. All natural*. Rosemary extract. Water. Organic sugar. Vinegar. Salt. Humanely raised: Boar's Head Brand® defines humanely raised as animals raised with shelter, resting areas, sufficient space and the ability to engage in natural behaviors. No nitrate or nitrite added. Except for the naturally occurring nitrates in sea salt. Raised without hormones. No antibiotics ever. Poultry raised without the use of antibiotics, hormones, growth promotants or animal by-products. Vegetarian grain fed. Federal regulations prohibit the use of hormones in poultry. Vegetarian grain fed. No preservatives. Poultry was vegetarian grain fed. Inspected for wholesomeness by U.S. Department of Agriculture P-19527. Net Wt 7 oz (198 g). 0g Trans fat per serving. Extra lean. Gluten free. Low fat. Milk free. No artificial colors or flavors. No caramel color. No casein. No erythorbate. No filler or by-products. No HFCS. No MSG. No partially hydrogenated oils. No soy. Rich in protein. Saturated fat free. 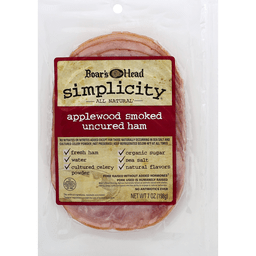 Tender and full of flavor, Boar's Head Simplicity™ all natural* deli meats and cheeses are crafted with wholesome, quality ingredients you can trust to feed your family. *No artificial ingredients, minimally processed. Visit: www.boarshead.com. © 2016 Boar's Head Brand®. 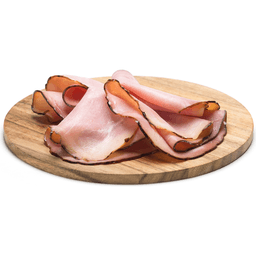 Boar's Head® Simplicity® Smoked Turkey Breast. Brunckhorst's brand. All natural. * Turkey breast. Water. Vinegar. Rosemary extract. Organic sugar. Sea salt. Humanely raised: Boar's Head brand® defines humanely raised as animals raised with shelter, resting areas, sufficient space and the ability to engage in natural behaviors. 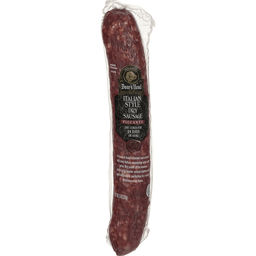 No nitrates or nitrites added, except naturally occurring nitrate in sea salt. Raised without hormones. No antibiotics ever: Poultry raised without the use of antibiotics, hormones, growth promotants or animal by-products. Vegetarian grain fed. Federal regulations prohibit the use of hormones in poultry. Vegetarian grain fed. No preservatives: Poultry was vegetarian grain fed. Inspected fro wholesomeness by U.S Department of Agriculture P-19527. Net Wt 7 oz (198 g). 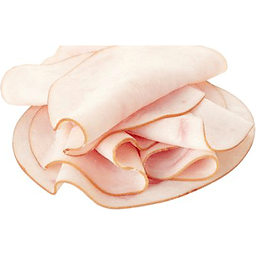 Tender and full of flavor, Boar's Head® Simplicity™ all natural* deli meats and cheeses are crafted with wholesome, quality ingredients you can trust to feed your family. 0g of Trans fat per serving. Extra lean. Gluten free. Low fat. Milk free. No artificial colors or flavors. No caramel color. No casein. No erythorbate. No fillers or by-products. No HFCs. No MSG. No partially hydrogenated oils. No soy. Rich in protein. Saturated fat free. *No artificial ingredients, minimally processed. © 2016 Boar's Head Brand®.